Pharrell Williams is looking to change the way that people learn to produce music with a new company called Tuniversity. To kick things off, he’s released an interactive iBook that shows you how to recreate his mega-hit Happy in GarageBand on the iPad. 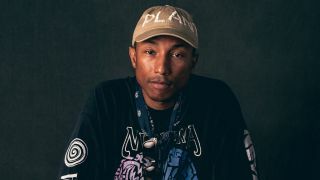 Written by Pharrell’s guitarist Brent Paschke and Kiko Doran, the book starts with Pharrell explaining what inspired him to write Happy, and then deconstructs its individual parts. You’re then shown how to bring them all together in GarageBand. The package includes 11 screencasts, two videos of Pharrell, audio examples, three interactive widgets and two GarageBand sessions (these are emailed to you). It’s available now from iTunes priced at £4.49/$4.99.